A cough drop is medicinal tablet designed to deliver active ingredients which suppress or relieve the cough reflex. They are made just like hard candies; ingredients are mixed together, they are cooked, cooled, and packaged. First developed during the eighteenth century, cough drops have become a significant part of the $2 billion cough and cold market. Anyone who has gotten sick knows the sensation of a cough. It is a natural reflex that helps protect the body from infections. It plays an important role in clearing the throat and other air passages of secretions and irritating particles. These particles include dust, food, liquids, and mucus. A cough occurs in three distinct steps. It typically begins with a deep breath which draws air into the lungs. The vocal cords spontaneously close thereby sealing the windpipe. Next, the air is compressed by the tightening of the expiratory muscles. The vocal cords are suddenly opened and the air trapped in the lungs is rapidly expelled along with any foreign debris in the windpipe. Coughs associated with colds can be either productive or nonproductive. A productive cough helps clear the respiratory passages of the lung. A nonproductive cough is brought on by a minor irritation and has a limited benefit. It is the nonproductive cough that cough drops are designed to sooth or suppress. The are two types of active ingredients in a nonprescription cough drop including expectorants and cough suppressants. An expectorant is a material that aids in the removal of phlegm from the respiratory tract. It works by blocking the sensory nerves that are involved in triggering a cough. While many expectorants are available, data about their functionality is not. Some clinicians even question whether expectorants are effective. Antitussives, which are cough suppressants, work in a variety of ways affecting either the lungs, muscles, or brain. Using syrups and herbal teas to control coughing has been known since antiquity. An ancient Hebrew text suggests the use of goat's milk for this reason. In the second century, Galen was perhaps the first to report an effective cough suppressant. Cough drops originally developed from candy. The first hard candies were produced during the fourth century. Since sugar was so expensive, these products were typically a luxury item available only to the rich. Over the years, sugar crops were planted in North America and throughout the world. Sugar refiners were established, and the price of sugar was reduced, making it available to everyone by the eighteenth century. While the active ingredients in a cough drop were known for centuries, it was not until the nineteenth century that the cough drop was born. One of the first mass-produced cough drops was the Smith Brothers cough drop. According to the company, James Smith was operating a restaurant when a journeyman introduced him to a formula for a cough candy. He mixed up a batch in his kitchen and was able to quickly sell them. Demand for his product grew and he began advertising in 1852. He enlisted the aid of his two sons who helped mix batches and sell them on the streets of Poughkeepsie, New York. They inherited the business in 1866 when James Smith died, and renamed the company Smith Brothers. During this time, they sold their cough drops in large glass bowls. To prevent imitators, they developed a unique package in 1872 that was filled at the factory. In 1922, menthol cough drops were introduced. Over the years, a variety of manufacturers have developed their own cough drop formulas. Each one has tried to improve the flavor and efficacy of their product. Cough drops have two categories of ingredients. One type makes up most of the cough drop while the other is the active, or functional, ingredients. The major portion of cough drops is made up of ingredients found in typical hard candy recipes. The essential ingredients include sugar, corn syrup, acids, colors, and flavors. Sugar is a disaccharide compound called sucrose. It is obtained primarily from sugarcane or sugar beets by an extraction process. In a cough drop recipe, sugar crystals are usually used. Sugar is responsible for the physical structure of the cough drop along with its sweet taste and mouthfeel. Corn syrup is a main component of cough drops. It is a mixture of sugars that is composed of polysaccharides, dextrose, and maltose. The main reason it is used is to control the crystallization of sugar. It also provides some sweetness and body to the cough drop. Additionally, it reduces the formation of dust from sugar during the blending stage. To increase the visual appeal of the cough drop various dyes are added. In the United States, these dyes are strictly regulated by the government. Some that are allowed in food products include red dye #40, yellow dye #5, yellow dye #6, and blue dye #1. Natural colorants like caramel coloring are also used. Using only these colorants, the most popular cough drop colors, red and blue, can be produced. To cover the taste of the active ingredients, various flavoring ingredients are put into cough drop recipes. Both artificial and natural flavors are used. Artificial flavors are mixtures of aromatic chemicals like methyl anthranilate and ethyl caporate. Natural flavors are derived from fruits, berries, and honey. Acids such as citric, lactic, tartaric, and malic acid are also included to modify the flavor. Various active ingredients can be included in a cough drop recipe. As mentioned previously, these can be either expectorants or antitussives. Some common ingredients are volatile oils such as menthol or eucalyptus oil. Volatile oils, or essential oils, are obtained from parts of a plant through extraction or distillation processes. Menthol is typically isolated from the Mentha arvensis plant or distilled from peppermint oil. It may also be synthetically produced. Menthol has a cooling effect in the mouth that helps to relieve irritation. It is also thought to work as an expectorant. Eucalyptus oil is isolated from the eucalyptus plant. It is believed to have a medicinal effect functioning as an expectorant and a relief agent for minor mouth and throat irritations. Recently, companies have been including zinc in their cough drops. Certain evidence suggests that zinc may be beneficial in fighting symptoms of a cold. Vitamin C is another ingredient that has been included in some brands of cough drops. Other ingredients that may be found are herbals such as echinacea or ginko biloba. Peppermint oil, camphor, and sodium citrate have also been used. Cough drops, or lozenges, are usually sold as small, hard candy pieces that slowly release their medicine as they melt in the mouth. Chemically speaking, they are a supersaturated solution of water molecules, sugar, and corn syrup. They can be either grained (opaque) or nongrained (clear). While all cough drops are designed to sooth and relieve coughing, some have added ingredients to help fight colds, freshen breath, or clear nasal congestion. Certain cough drops have reduced active ingredients and are created specifically for children. There are a wide variety of flavors, the most popular of which are cherry, honey, and menthol. Much like the manufacture of candy, the basic steps in producing a cough drop are mixing, cooking, cooling-working, forming, cooling, and packaging. have an automated production line connected by a conveyor system. 1 In this manufacturing step, the ingredients are combined in a large, stainless steel container by compounding personnel. Water is usually pumped directly in to the tank. The sugar, corn syrup, and certain other ingredients are then mixed until they are ready to be cooked. 2 To produce the cough drop, the moisture level of the mixture must be reduced. Some cough drops have a moisture content as low as 0.5%. There are three types of cookers that are employed. Batch cooking involves a direct-fire cooker. In this method, the heat is applied to the mixture from below and the moisture evaporates into the air. Quicker methods use either a semicontinuous cooker or a continuous cooker that operates under low pressure conditions. In the semicontinuous process, the cough drop mixture is first boiled under atmospheric pressure and then pumped into a second kettle that is a vacuum chamber. It is then rapidly cooked and drawn off for working. Continuous cookers use a scraped-surface heat-exchanger which can cook the cough drop within a few seconds. 3 After cooking, the cough drop mixture is conveyored to cooling slabs. It is cooled to facilitate incorporation of ingredients such as color, flavors, and active ingredients. The cooling slabs are composed of steel and have a built-in circulating water system. Candy plows are also involved. They move the mixture around so some of the hotter areas come in contact with the cooler surface of the slabs. As it cools, the mixture becomes plasticized and it looks like a workable mass similar to dough. 4 At this point, the rest of the cough drop ingredients are added. They are poured onto the batch and machines pull and twist the mass, working the ingredients throughout. When everything is adequately combined, the batch is split off and sent through a sizing machine. These devices roll the batch into a cylindrically shaped mass and reduce the diameter to a suitable size. From here, the mass is fed into the forming machines. 5 Various forming machines are available. Typically, cough drops are tablet-shaped products. The cylindrical mass runs through this machine and is cut into smaller pieces. These pieces are then put into a die and stamped to produce the desired shape. 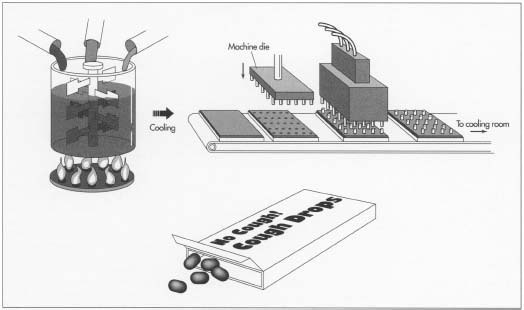 The cough drops are then ejected from the die and moved to the finishing phases of production. 6 The formed cough drops are rapidly cooled to ensure that they maintain their shape. This is done on a conveyor belt that is equipped with rapidly blowing air jets. From the cooling area, the cough drops are put into packaging. Many manufacturers wrap each cough drop in a wax paper package to prevent them from absorbing moisture from the air. A number of these are then put into a larger bag for final sales. Other manufacturers do not individually wrap their cough drops, but store them in a bulk package. These are typically a wax-coated box that is sealed. To prevent them from sticking together, bulk packaged cough drops are often coated. As with all food and drug processing facilities, quality control begins by monitoring the characteristics of the incoming ingredients. These ingredients are taken to a quality control lab where they are tested to ensure they meet specifications. Tests include evaluation of the ingredient's physical properties such as appearance, color, odor, and flavor. Certain chemical properties of the ingredients may also be evaluated. Each manufacturer has their own tests that help certify that the incoming ingredients will produce a consistent cough drop. In addition to ingredient checks, the packaging is also inspected to ensure it meets the set specifications. After production, the characteristics of the final product such as appearance, flavor, texture, and odor are also carefully monitored. The usual test methods involve comparing the final product to an established standard. For example, to make sure the flavor is correct, a random sample may be taken and compared to some set standard. Other qualities such as appearance, texture, and odor may be evaluated by sensory panels, a group of specialists that are trained to determine small differences. In addition to sensory tests, other instrumental measurements are taken. Cough drop recipes have changed little since they were first introduced. Most of the advancements have come in the design of the cookers and other processing equipment. It is expected that future improvements aimed at increasing the speed of production will continue to be found. Another area that will be expanded will be the addition of novel ingredients that may provide multiple benefits to the consumer. For example, some cough drop marketers have introduced vitamin C-containing products. These cough drops are intended not only to sooth a cough, but also relieve some of the symptoms of a cold. Alikonis, J. Candy Technology. Westport, CT: AVI Publishing Co., 1979. Covington, T. Handbook of Nonprescription Drugs. Washington, DC: American Pharmaceutical Association, 1993. Mathlouthi, M. and P. Reiser, eds. Sucrose: Properties and Applications. London: Blackie and Sons, Ltd., 1995. Friedman, M. "As Temperatures Drop, Cough Remedies Flourish." Adweek (February, 1989). Slezak, M. "Warm Weather Cools Cough and Cold Sales." Supermarket News (March 6, 1995).